We have saved our white rink liners in the past but remember these following points to ponder. White ice rink liners and replacement ice rink liner tarps come in rolls or folded neatly. When you are done with them for the season, the larger sizes are hard to fold up small and store as they were when you received them. While in storage they are susceptible to other forms of damage like mice eating holes or cats/dogs or children playing near them. Make sure they are stored properly and many years are probable when using the Liner Protection System. We have had a mouse chew a hole through our liner while stored improperly and have heard many a story relayed to us the same. When using the white patch tape make sure the cut/ gash area is dry. The white patch tape bonds best above 5 degrees. The patch tar sheet bonds best with heat. You can work with it in cool temperatures but a hair dryer and or a heat gun will bond the tar patch to your poly. CAUTION. The heat gun can do more harm than good. It can melt the entire section of white poly and actually make your situation worse. Do not hurry and keep away from your area by at least a 16″. Test the warmth from your heat gun at your liner to insure it is only warm and not hot. Remember you are simulating the suns rays. Hair dryers are our recommendation but you are simulating the sun here as well so you may need to actually hold the hair dryer above the patch area for several minutes. Time it! Test the edges to see if it peels off. Here is the scenario if you have an unsuspecting puncture or tear. 2) Lay your rink liner or replacement white ice rink tarp . 4) Turn on hose and fill. 5) 15 hours later wonder why rink is not filling. 6) Wade through water with shoes off (very cold) to locate hole. After finding or not finding hole(s) decide to replace. Repeat steps 1 through 4 again. You decide what works best for you! Assembling your frame to complete the “best outdoor rink on the street” is slightly different than the basic rink frame assembly. Is the top of your frame level all the way around the perimeter? This means you need to know the level of your outdoor rink site. Check it! If you are handy man you will know how to do this. Perhaps you know someone if you aren’t sure? You will need to cut your lumber to the lay of your backyard rink site slope. This is very easy but you need a skill saw. See You Tube Video below. Assemble your angle cut frame under your straight 2″ x 8″ frame by using the 5in1 Rink Stake to bind top and bottom together. Your frame height will need to be at least 3-4″ higher than your maximum water depth or slope as per your slope calculations done with your line level, transit or laser line level. When your water depth becomes 7″- 8″ in depth you will need to start to increase the frequency of the placement of your 5in1 Rink Stake. One every 6′-8′. If you are using 12′ lengths for your framing material the natural 5in1Rink Stake placement would be every 6′. If you get to a 9”-12” depth of water you will need to place 5in1 Rink Stake every 4’-6’ and Support 45’s should be added. 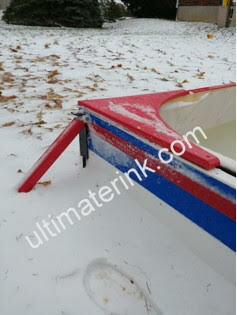 If you approach 16” in water depth 5in1 Rink Stake need to be placed every 3′-4’ and Support 45’s will need to be added. This is the order of install of these add on items, to create your “Best on the Street” outdoor rink. 1. You will then use the Presto Install Support 45’s in your personalized colors as additional support. Above in red and blue and at 45 degree to the ground.After the liner is installed and not fastened (use liner clips) turn on the water. As the water level gets higher the water level height is now similar all the way around the inner frame. 2. Once the water covers all the liner of your outdoor rink and the minimum depth is 2″-3” then add Presto Install Corner Seats in your color choice. Just 3 screws each. 3. After your Presto Install Corner Seats, add your PuckGoRounds to match the arc of the Corner Seats. Just 6 screws each. 4. Once your Presto Install Corner Seats and PuckGoRounds are installed in that order then its time for The Liner Protection System in 6’ sections either installed with screws or GripnGo’s. You will need to cut your L.P.S. in 6′ sections and back roll the curl out for easy install. You may also just roll our the entire roll and fasten as you go. A helper here for the install is good due to the length of the L.P.S. roll. 5. It finishes it all off…Presto Install T.E.P. (Top Edge Protect) Your color choice to coordinate with your favorite team. Our favorite for personalization, customization, and presentation. 6. Easy Install Backboards – 4’ x 8’ sheets of 5/8” plywood across one end or both ends of your rink. Use the 5 in 1 Rink Stake again as a slim line brace with the bend “J” hooked over the boards so your plywood can be placed right next to the rink frame. This is the flexibility of the 5 in 1 Rink Stake. No extra add on items to buy. Use the Classic -Brace Series 2 to lock down your supports for your backboards. with 1″ x 6″ s.
7. Add your personalized logo in Bulldog, Eagle, Shark or Wolf characters. Get your name added to it as a Center Ice Art logo or as a Board Banner or Deck Banner. If you are hesitant about the Center Ice Art logo and Solar Melt, (the reason why you don’t install red and blue lines) don’t worry we have solutions for that as well. Call 1 800 448 6648. We have over 25 years of experience in fast and easy systems that allow your success. Good advice because we know!! 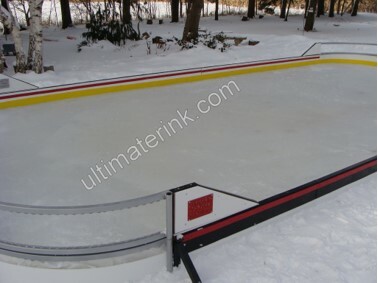 The 3 most important things to a successful and Ultimate Outdoor Rink. Pristine liner. No punctures, No tears. No mouse chews or human or animal made damage, No screw/nail/staple punctures below water level. Proper slope/grade calculations for Best Outdoor Rink on the Street assembly or if no measurement is done then the ability to add to your original frame with your second tier addition because you have enough liner to do so. Be sure to have 2′ on all sides as extra poly. Enough support to hold the water weight/depth inside your frame. 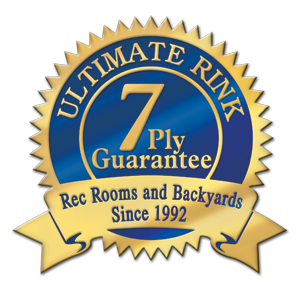 Rink Guru’s note: We believe that if you have done your homework and know your outdoor rink site, you can order all your requirements the first time and not need to order more items for your success at a later date. We have no problems serving you and your needs anytime.